To the (bleeping) Canadiens. On home-ice. In Game 7. 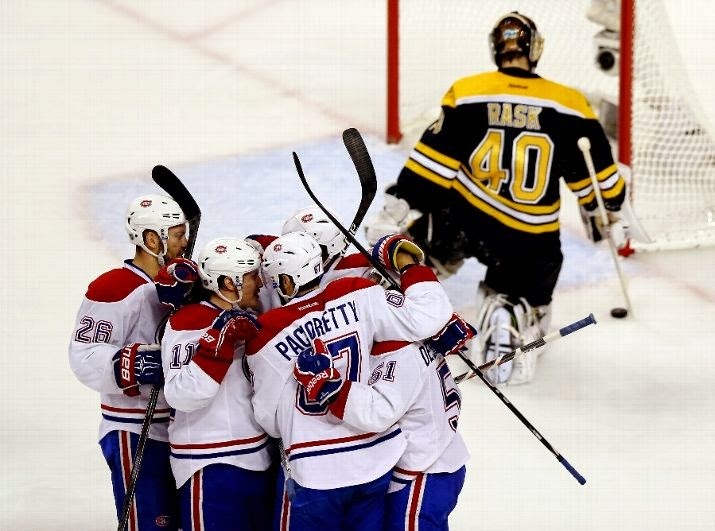 The Boston Bruins were eliminated from the 2014 playoffs with a 3-1 loss in Game 7 to the Montreal Canadiens. Game over. Season over. The Bruins' best season in four decades comes to a crashing halt versus their biggest and most hated rival. In a series that has seen the Bruins struggle in every facet of the game at one point or another, the first period of Game 7 was probably the worst we've seen them play. They were tentative in making passes, couldn't withstand the Canadiens' forechecking pressure, couldn't make breakout passes out of their zone, and couldn't establish any sort of offensive traction in the Montreal zone. It didn't take long for the Canadiens to make the Bruins pay for their lazy play to start, as it was Dale Weise who smacked home a cross-ice pass from Daniel Briere to put Montreal up 1-0 just 2:18 into the game. Matt Bartkowski, who's been much maligned in his poor play this series, continued his bad form, as he let Weise slip in behind him untouched to get the position to put the pass home. There was nothing doing for the Bruins the rest of the period, as they just simply could not generate any sort of offensive presence against the Canadiens. The B's outshot Montreal 9-6 in the period, but practically all of the shots were from the outside near the boards and barely anything in close on Price. The shots that did get through on Price were either along the ice or straight into the 'C' logo on his chest. Maybe the worst moment from the first period of play came from Brad Marchand, as he found himself alone in front of Carey Price and somehow skied the wristshot over everything and off the glass. Marchand had no one around him for five feet in all directions. Price was down in his stance with acres of room above his shoulders. Marchand ripped the shot three feet over the crossbar. A microcosm into how bad the first period, and the series as a whole, went for the Bruins. It was Marchand again doing his best to damn the Bruins into a bigger hole, as he was called for unsportsmanlike conduct for spraying Carey Price just seven seconds into the period. Ticky-tack call? Of course. It's Game flipping 7 and the refs called a penalty for spraying the goalie. The same action that Lars Eller was NOT called for in Game 2 when he sprayed Tuukka Rask, which resulted in a scrum behind the Bruins net. Even with the crap call, the referees were not the reason why the Bruins found themselves needing to climb out of a deficit. The Bruins finally woke up and started to hit the Habs in their own zone, controlling play for the first half of the second period but they were still unable to break through on Price. The B's outshot the Habs 6-1 through the first half of the frame, with the best chances coming from Loui Eriksson in close in the crease and again with Patrice Bergeron a shift later. Bergeron had a two-on-one with Eriksson, but Bergy held onto the puck too long and was left with a weak attempt on net, which Price saved with relative ease. With Tuukka Rask turning aside a few chances in close on Brain Gionta, it was the start of the Habs returning the pressure back on the Bruins to get back into the game. It payed off when Max Pacioretty rifled home Montreal's second goal of the game at 10:22 of the period. With the Bruins again failing to make a play out of their own zone, it was Brendan Gallagher who came out of a pile with the puck on his stick, and with the Bruins out of position, Pacioretty was left all alone in the dot to fire the one-timer past Tuukka Rask. Boston found themselves in a familiar hole that was a constant through this series: trailing by two goals. 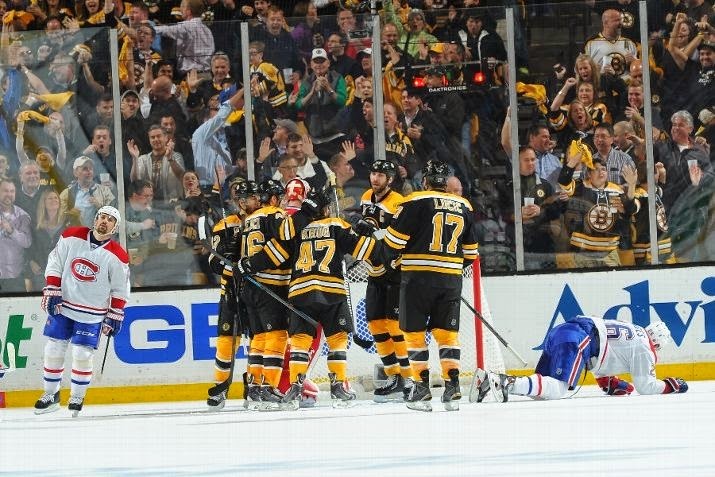 In five of the seven games played, the Bruins found themselves down by a deuce at one point or another. Not exactly a winning formula for advancing in the playoffs. The Canadiens continued to do what they do best, adsorbing whatever pressure the Bruins could put on them, and then breaking out quick on counter attacks. The B's finally broke through on the power-play late in the period, when Torey Krug rifled a shot on net with Jarome Iginla screening in front, and it was Iginla who deflected the puck past Carey Price to get the Bruins on the board. 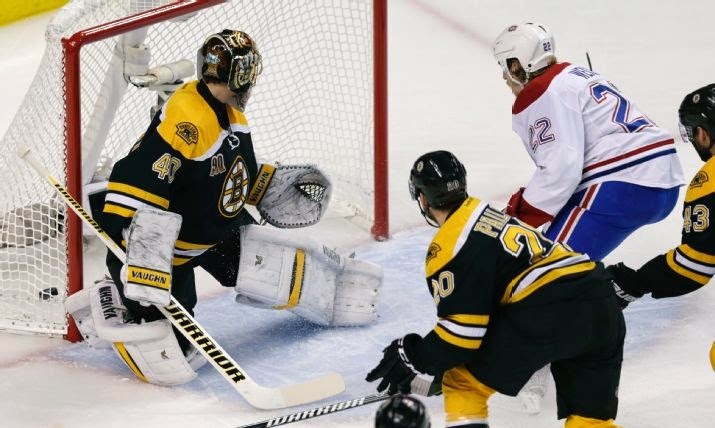 But the third period saw more frustration on the part of the Bruins, and even with Boston doubling the shots over Montreal to the tune of 8-4, it was Montreal who withstood the pressure and added another tally late in the game. Around the fifteen-minute mark, Jarome Iginla backhanded a puck in close off the right post, marking the 13th (give or take one) post the Bruins hit in the series. Bad puck luck? Squeezing the stick? It doesn't matter. They weren't goals. Whatever pressure the Bruins managed to throw on the Habs as the clocked ticked down towards 0:00, none of it was particularly life-threatening, or in the case of the Bruins, season-saving. After Johnny Boychuk was whistled for an interference call on Michael Bournival in the neutral zone at 15:29, the Bruins were left to kill a 2:00 minute power-play with 4:30 left on the clock. But the Habs left the Bruins to worry about something else besides the clock, and that something was another two-goal deficit. Daniel Briere drove the net and tried to pass across the ice, but instead the puck deflected off of Zdeno Chara's skate and past Tuukka Rask. 3-1 Habs. The Bruins did get a powerplay late, allowing the B's to pull Rask for a 6-on-4 for the last two minutes of the game, but nothing came of the opportunity. No more amazing comebacks. No more goals. No more season. 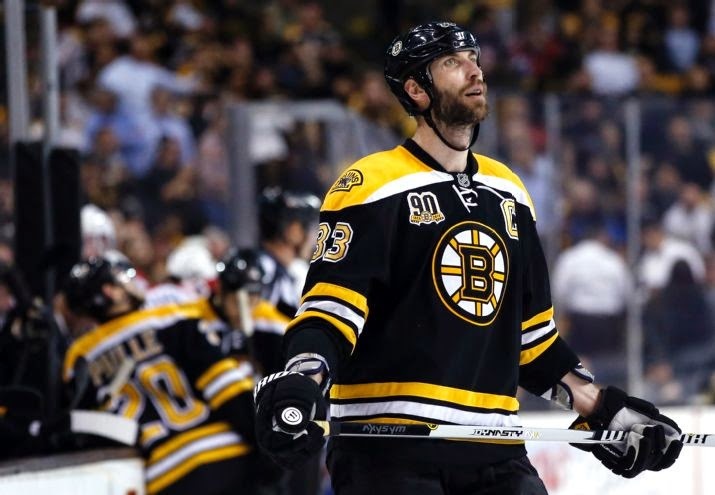 The 2013-14 Bruins season has been ended by their greatest rival. Another chapter in the long history between the two teams. 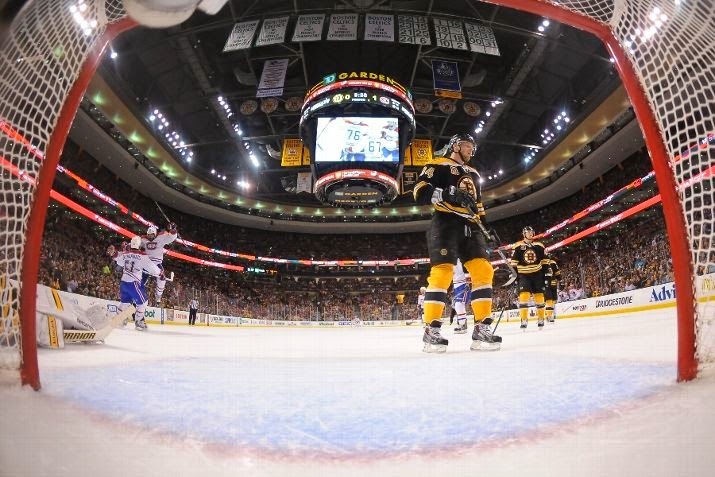 The Bruins are sent packing, the Habs move on to host the Eastern Conference Final vs the New York Rangers.